transcosmos realizes seamless communication in operational processes and improves “Operational Excellence” through centralizing e-commerce operational functions in One-Stop Center. We execute “Real-Time Marketing” to streamline sales and marketing processes to expand clients’ sales in this dynamic market while rapidly improving operational processes from consumers’ perspective to optimize “Customer Experience”. Photo shoot clients’ products without any lead-time. Use models and shoot photos according to the Website design to make the best appeal of the products. Analysis specialists visualize challenges / solutions and strategically develop specific measures such as retention measures required for business expansion, cross-sell and upsell. Execute daily operation such as E-Commerce Website designing and uploading product on E-Commerce Website according to clients’ brand strategy. Plan and operate internet promotion for customer acquisition and execute retention measures for customer retention based on customer data analysis. Operate ordering related administrative tasks in the optimum manner based on the clients’ product inventory level. Provide high-quality logistics operation service by controlling the tasks from receiving, storing to shipping of clients’ products in the optimum way. Support overseas shipping process and international delivery. transcosmos provides value-added services for distribution processing to meet brand requirements (gift wrapping, enclosing message cards, etc. ), in addition to fulfillment service until the products reach the hands of consumers (quality storage, packing, shipping). With eCommerce HUB, which adheres to the operational know-how fostered as an outsourcer, we can provide efficient operations. International shipping services are also available to satisfy globalized logistics. Customers’ precious products are delivered all over the world by handling administrative tasks such as invoicing and customs paperwork. The largest company in e-commerce one-stop services industry in the United States, listed on NASDAQ. 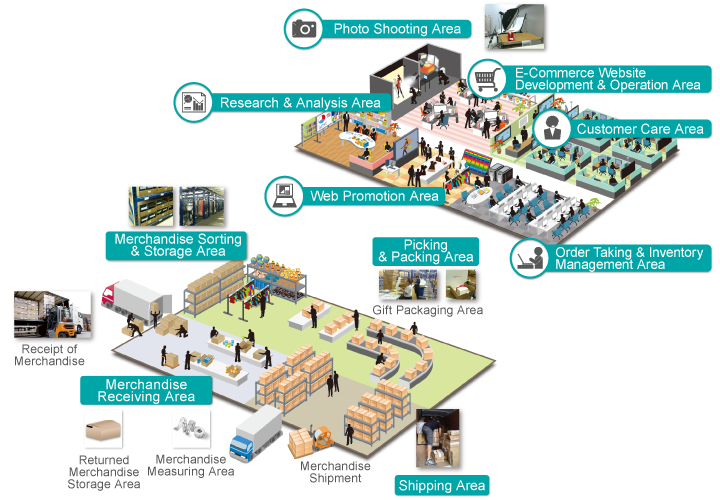 In addition to providing fulfillment service with its own warehouse and back-office services such as customer support and payment processing, the company provides a wide range of services from developing e-commerce systems to system operation for over 150 clients.The total working space is approximately 193,000 square meters, approximately equivalent to 4.1 times the size of Tokyo Dome which boasts the largest seating capacity in Japan. As an e-commerce one-stop services provider with a focus on Latin America, the company offers extensive e-commerce related services ranging from developing e-commerce websites, supporting store openings on Brazil’s local online marketplaces, fulfillment, online marketing to customer care.